A pair of Baffies to fit a foot 24.5cm / 9¾in long used 30g / 66m / 72yds of MC and 24g / 53m / 58yds of CC. Larger / smaller Baffies will use more / less yarn. 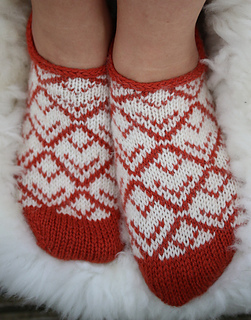 26 sts and 29 rounds to 10cm / 4in over both plain and colourwork stockinette stitch using gauge-size needles. This was achieved using size 3.5mm / UK 10-9 / US 4 needles. 22 sts and 40 rows to 10cm / 4in over garter stitch using gauge-size needles. 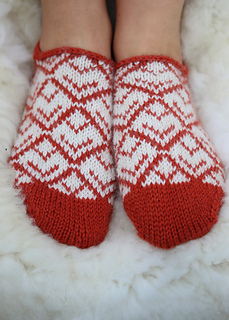 You may need different sized needles to match gauge in all three stitch patterns. Please check your gauge carefully and adjust your needle size accordingly. A simple way to check gauge is to cast on, work the toe, give the fabric a steam with an iron on the wool setting (do not allow the iron to touch the fabric), allow the fabric to relax; check your gauge, and go up or down a needle size as necessary.